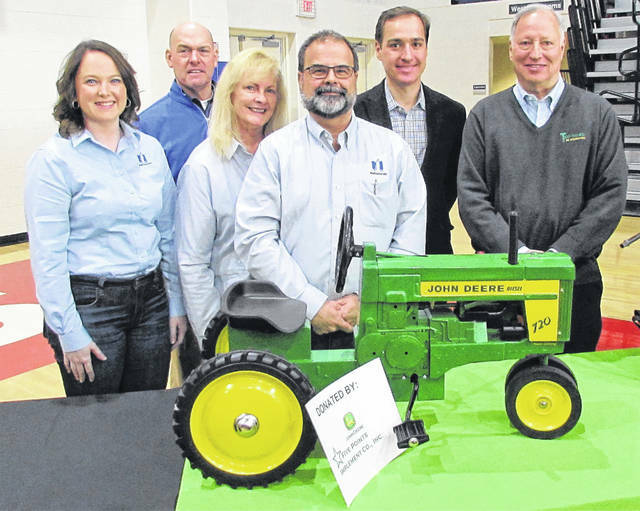 Russ Newman of Newman Insurance Agency purchased a John Deere 720 pedal tractor in an auction at the close of the Ag is Everyone’s Business seminar held Friday at the Patriot Center at Southern State Community College. The pedal tractor was donated by Five Points Implement Company of Hillsboro. The high bid was $950 and will benefit the FFA chapters of the five Highland County public school districts. Newman is shown in the center with members of his staff. Keynote speaker for the event Mark Gold is at the right.